If you’re interested in learning how to meal plan, this post is definitely for you. While I’m an organized person by nature, meal planning has never been my forte. I’ve never particularly enjoyed cooking, and since my husband and daughter both have significant food sensitivities, I could never really wrap my head around trying to find easy-to-make meals we could ALL enjoy. It seemed much easier to prepare 3 distinctly different meals each evening to meet each of our needs and wants, and even though the things I was making were simple and boring – and I was often serving the same things day after day – it wasn’t until I committed to learning how to meal plan that I realized how much time (and food) I was wasting each week. I can’t remember exactly what prompted me to learn how to meal plan, but I have been doing it religiously for ~6 months now, and it has completely changed my life. We’re eating a much more balanced diet, my husband and I have both lost weight, our monthly food bills have decreased, I’m spending less time at the grocery store and in the kitchen each week, and I very rarely throw away spoiled produce. I’m so excited to share my best tips and hacks to teach YOU how to meal plan, too! For those who aren’t in the know, meal planning is essentially the process of planning your meals for a given period of time – usually a week – and then creating shopping lists to ensure you always have the ingredients on hand for the meals you are going to cook each day. By taking the time to plan ahead to ensure you are prepared, you can adhere to a variety of goals you might have for yourself, like eating healthy, cutting down on your grocery bills, and decreasing the amount of time you spend in the kitchen and at the grocery store each week. Now that you know why you should learn how to meal plan, here are some meal planning tips and ideas that have really helped keep me organized and remain committed to my meal planning goals. Make it part of your weekly schedule. Pick a day/time each week to sit down and plan your meals for the following 7 days. I typically do this on Friday afternoons when I’m winding down from a busy week, but recently I’ve been doing my meal planning on Sunday mornings while sitting poolside at my daughter’s swim lessons. 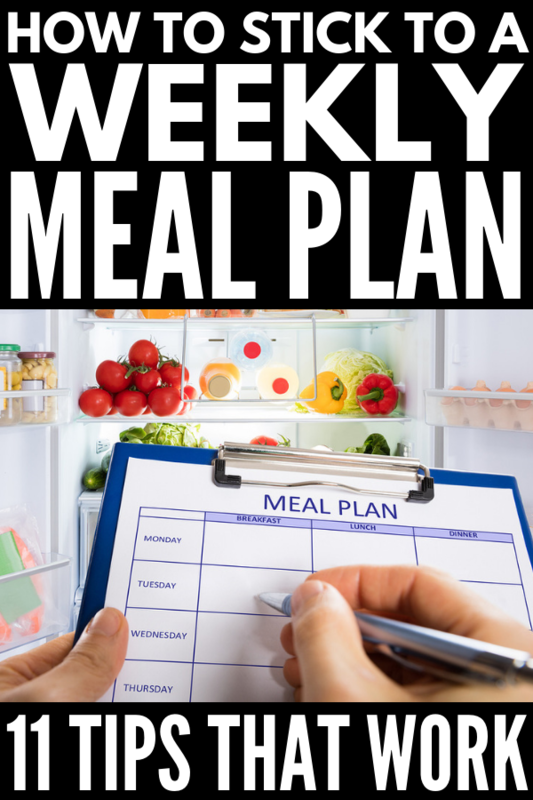 The point is to find a time when you can commit to creating your weekly meal plan, and then physically schedule it into your calendar so that you don’t forget. It will eventually become a habit, and you will be amazed at how much time 20 minutes of upfront planning can save you over the course of a week! Plan ahead. One of the reasons I started meal planning during my daughter’s swim lessons is so I can consult with my husband and confirm which night(s) he will be working late or traveling so I can plan accordingly. We also use this time to discuss any upcoming events where we will either be eating out or entertaining in our home, and sometimes we go completely nuts and search for new recipes to try together on a Saturday night when we know we’ll have more time to cook. Create a family calendar. This is sort of an extension of the point above, but I wanted to mention it anyway. If you struggle to stay on top of the activities, appointments, and social commitments for everyone in your family, create ONE master family calendar so you know who will be home for each meal and can plan accordingly. There are so many different ways you can do this – you can go old school and buy a wall calendar to hang in your kitchen, or you can download a fancy app that allows multiple users to make updates and changes. Whichever option you choose, make sure there is only ONE place where everything is recorded to help with your meal planning. Compile a collection of easy recipes for busy times. Contrary to popular belief, meal planning doesn’t mean you have to create elaborate, time-consuming meals each evening. Unless you want to, of course! A much better plan is to curate a mixture of recipes with varying levels of difficulty, and schedule them based on how busy your week is. We do more basic meals during the week, like baked salmon with roasted sheet pan veggies or a chicken Cobb salad, and on weekends we do more complex meals, like roast beef and honey-glazed carrots or spaghetti squash pad Thai. and need some recipe inspiration, we’ve got just what you need! Choose recipes with common ingredients to avoid food waste. This may take a little practice, but will help reduce food waste and decrease your grocery bill over time. Admittedly, I’m not very good at planning multiple recipes using similar ingredients, so instead I either make the same meal 2 times in the same week, or I make a big enough batch that I have enough leftover for lunch the following day. Use an app. When I first started learning how to meal plan, I used an Excel spreadsheet to create my weekly schedule, and while it certainly did the trick, it was tedious in that it required me to be in front of my computer. But then someone introduced me to the Paprika app, and it totally changed my life! Simply load your favorite recipes into the app and then you can create meal plans AND shopping lists which you can share with others via text or email. Learn more about the Paprika app HERE. Write out your grocery lists (and stick to them). If you’re the type that likes to wing it at the grocery store, it’s time to commit to change! Whether you go grocery shopping once every 2 weeks, or once every 2 days, spending an extra 5 minutes or so looking through each recipe in your meal plan that you’re shopping for can save you HEAPS of time. It can be very tempting to ditch a meal in favor of takeout when you’re missing one or more of the ingredients, so think of your grocery list as a means to sticking with your healthy eating goals. Need to stop overspending on groceries? Erin Chase offers a fabulous course called Grocery Budget Makeover that will teach you how to significantly slash your grocery spending. She’ll teach you how to create an effective shopping list, meal plan effectively, stockpile, avoid marketing traps, and score freebies, and she’ll also teach you the art of couponing (if you live in the US) as well as some fabulous time-saving kitchen and cooking hacks. CLICK HERE for more info! Invest in an instant pot. If you’re constantly pressed for time and/or not a huge fan of cooking, it’s time to invest in an instant pot, which is a multi-cooker that takes on the job of pressure cooking, slow cooking, rice cooking, steaming, yogurt making and more! Just throw all your food into the instant pot and it cooks it for you in a single pot. You can even cook frozen veggies and meat since the instant pot defrosts and then cooks the food. It comes with preset programs depending on what you’re cooking, so you can rest easy that you’ll have a perfectly cooked meal with minimal effort at the end of the day. Operation: leftovers. Another great tip to consider if you’re trying to learn how to meal plan is to plan your dinners such that you have leftovers for lunch the following day. Not only does this save you unnecessary time in the kitchen, but it’ll also cut down on food waste. You can either double your recipes to ensure you have enough leftover, or you can get creative. For example, I like to create power bowls with leftover roasted veggies and chicken using spinach, quinoa, avocado, and a little dressing. YUM! Prep ingredients and meals ahead of time. We often hear people use the terms ‘meal plan’ and ‘meal prep’ interchangeably, but they aren’t really one and the same. Meal planning is all about putting together a list of recipes for a given period of time so you can create grocery lists to ensure you always have the ingredients on hand, whereas meal prepping involves preparing meals ahead of time. Many people like to block off a couple of hours on Sundays to prep and freeze meals for the coming week (more on that below), but if that isn’t something you’re interested in committing to, chopping fruits and vegetables ahead of time can be a huge time-saver on days you know you’ll be strapped for time. Make sure to have a set of meal prep containers available so you can store and label everything. I recently invested in this set of glass storage containers and love that it comes with a variety of shapes and sizes, and that I can see exactly what is in each container. Make freezer-friendly meals. Setting aside time each week to create freezer meals can be a huge help with meal planning. All it takes is one trip to the grocery store and a few hours in the kitchen, and you can have a week’s worth of freezer meals at your fingertips for a fraction of what you probably pay to feed you and your family. Of course, there’s a science behind this method – you need to know what to buy, what to make, and how to prepare it FAST. Thankfully, Erin Chase offers another fabulous course called MyFreezEasy which will teach you how to make 10 meals in an hour. I’m not kidding. Sign-up for MyFreezEasy here. Phew! That was a lot of information, but I hope these tips and ideas will not only help you learn how to meal plan, but make it easy enough to sustain for the long-haul. Remember to be consistent, plan ahead, and keep it simple! If you found this collection of tips and hacks to teach you how to meal plan helpful, please share this post on Pinterest! And if you’re looking for more health-related tips and tricks, please follow our Health board where we share all kinds of great ideas we find each day!